Kungfu4less.com provides the best in rank belts for the various types of martial arts. 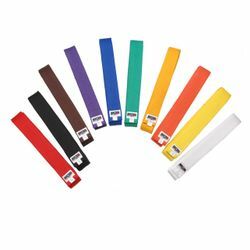 You can find Black, 2 inch Wide, Mizuno Approved Black Belt, Adidas Belts, Kung Fu Sashes and others that are approved for use in rankings, for martial arts participants. These products are available at economical prices. The rank belts determines the expertise of a student in his/her respective martial art. Belts are available in multiple colorslike black, red, green, blue, brown, white etc. depending on the student's level of certification. The black belts are used to symbolize an expert in a particular martial art, however, there are additional levels of even the black belt. These belts became popular during the late 19th century. The white belts are for the beginners/novices. The other colors represent the mid-level students so they can be easily identified by a visitor to the dojo. The belts offered by Kungfu4less.com are stitched with multiple rows to make them durable and long lasting. These belts will not wear and tear easily and will offer full value for money. They can be easily washed in a washing machine. We also offer Mizuno's made in Japan black belts which offer a unique gold colored rubber label. 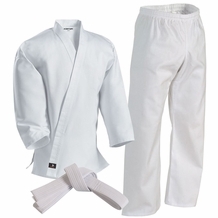 This black belt is extremely popular among martial arts participants, both students, and instructors. 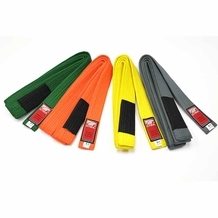 You can purchase different rank belts like the Black, 2 inch Wide, , Adidas Belts, Kung Fu Sash belts etc. 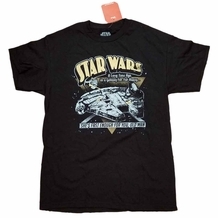 All of our products are of the highest quality and are economically priced.